AARP Finds Toll On Family Caregivers Is 'Huge' More than 40 million Americans care for a loved one at home, providing some $450 billion of care a year, says a new AARP study. Advocates say they're tired, stressed out and at higher risk of health problems themselves — and the problem could get worse as the baby-boom generation enters old age. 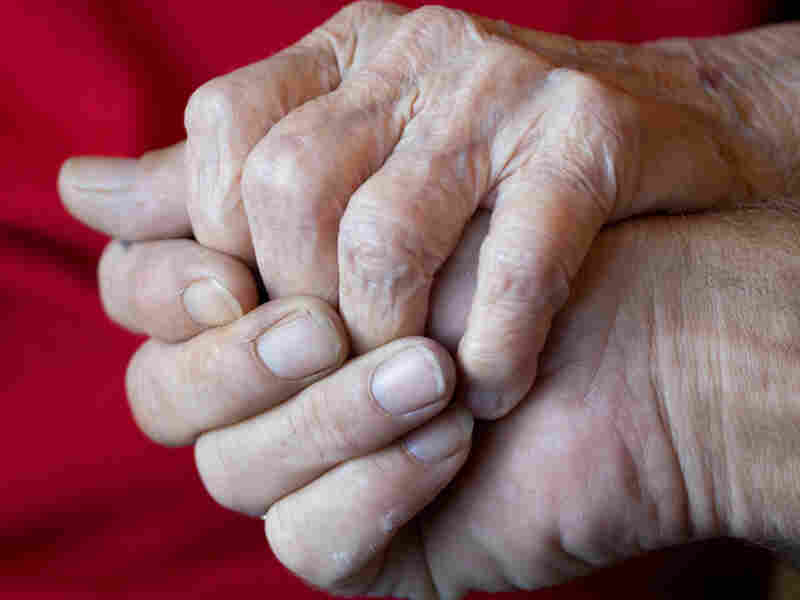 A new study by the AARP estimates that for the more than 40 million Americans caring for an elderly or disabled loved one, the value of their work is $450 billion a year. That's a good deal for society. But for the family members doing the work, the study finds they need a lot more help. Take Cymando Henley, 36, whose mother was diagnosed with multiple sclerosis when he was starting college. She now must use a wheelchair, and Henley has been taking care of her for nearly two decades. Henley does have help. Montgomery County, Maryland, where they live, and the MS Society pay for a combined 35 hours of home health aides each week — though that's threatened by budget cuts. But every day, Henley must help his mom in and out of bed and onto the toilet. He even rolls her over in the middle of the night if she becomes uncomfortable. Care like this from a professional can cost tens of thousands of dollars a year. But Henley does it for free, and it's on top of his full-time job. The AARP study finds that family members spend an average 20 hours a week providing care. Henley refuses to count, but his mom, Vicki, keeps tab. Modern medicine now allows people to manage chronic conditions for decades. But the AARP study finds that increasingly complicated procedures are routinely expected of family caregivers. The typical caregiver already has a full-time job, and helping an elderly or disabled loved one can feel like a second. Think twice about leaving your job, cautions the MetLife Mature Market Institute. Though it's tough to juggle a job and caregiving, those who cut back work can jeopardize their own retirement. Look for an employer with family friendly policies, suggests AARP, such as flextime, telecommuting or backup in-home care in an emergency. Reward yourself with respite breaks often, advises the National Family Caregivers Association. Henley recalls a time when his mom was being discharged from the hospital. She had a catheter in, and the nurse said someone would call him and tell him how to take it out over the phone. "And I said, 'Oh, no you will not.' 'Cause I'm like, really? This is my mother," he says. "The burden on families is huge," Feinberg says. "While families are stepping up to the plate and make this contribution to society, the cost to their own health and financial security is huge." The study finds that those who cut back work lose hundreds of thousands of dollars in income over a lifetime. Feinberg says caregivers are also more prone to depression, physical ailments and social isolation. "They will burn out, they will get sick, and there will be no other option but to place someone in a nursing home, which is what nobody wants," Feinberg says. They will burn out, they will get sick, and there will be no other option but to place someone in a nursing home, which is what nobody wants. And if the burden for caregivers seems big now, according to Suzanne Mintz of the National Family Caregivers Association, it's only going to get worse as the baby-boom generation enters old age. On top of this, there's a shortage of paid home health aides. Last week, the Obama administration joined labor groups calling for the creation of 2 million more jobs in home health care, plus a new visa for immigrants willing to enter the field. Mintz has grappled with the problem in caring for her husband, who has multiple sclerosis. Earlier this year, she had trouble finding someone to change his catheter twice a week while she was at work. So she says she resorted to something a little crazy. "It might be, 'I can drive her to PT for the next five Thursdays,' or 'I can bring meals for the next six months,' " Mintz says.